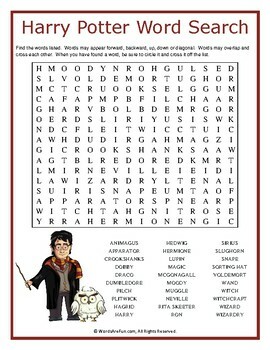 A word search puzzle featuring words associated with the famous Harry Potter books written by J. K. Rowling. 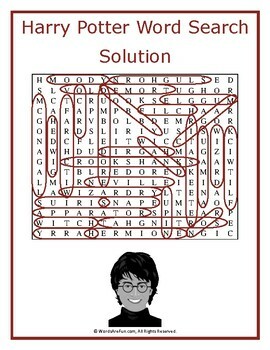 This puzzle is perfect for current fans, as well as, those soon-to-be ones. Use this sheet as part of your teaching curriculum, a treat for early finishers or just for fun. Word List: Animagus, Apparator, Crookshanks, Dobby, Draco, Dumbledore, Filch, Flitwick, Hagrid, Harry, Hedwig, Hermione, Lupin, Magic, McGonagall, Moody, Muggle, Neville, Rita Skeeter, Ron, Sirius, Slughorn, Snape, Sorting Hat, Voldemort, Wand, Witch, Witchcraft, Wizard, Wizardry.